Ne-Yo and show designer Angela Simmons greet a particularly adorable fan and pose for a photo as they attend The Compound Foundation's Annual Holiday Giving Tour, during which they were visiting the Boys and Girls Clubs of Miami. The designer daughter of Run-D.M.C. 's Joseph Simmons, Angela Simmons, talks about her plans for the holidays as she visits Miami's Boys and Girls Clubs for The Compound Foundation's Annual Holiday Giving Tour. Run D.M.C. star Joseph Simmons fashion designer daughter Angela Simmons appears to be having a lot of fun as she dances along to background music on her visit to the Boys and Girls Clubs of Miami. A host of celebrities attending the 2014 Summer Classic Charity Basketball Game were photographed while posing on the red carpet. The red carpet was graced by all manner of celebrities during the 2014 Summer Classic Charity Basketball Game. The Barclays Centre in New York City saw the arrival of such celebrities as MTV Host, Lenay Dunn, Angela Simmons (daughter of RUN DMC rapper, Joseph Simmons), former NFL wide receiver Terrell Owens, R&B singer/songwriter Ne-Yo, singer/songwriter Adrienne Bailon and radio personality and former rapper, Angie Martinez. Other celebrities included television personality Sammi "Sweetheart" Giancola, Skylar Diggins from the Women's National Basketball Association team 'Tulsa Shock', DJ Khaled and hip hop artist Fabolous amongst others. Run-D.M.C. rapper Joseph Simmons' daughter Angela Simmons is seen getting out of her car with her young niece and a friend as they set out to do some shopping in Beverly Hills. Angela Simmons, the youngest daughter of Run DMC rapper Joseph Simmons, Sr., is seen getting out of a car with a friend and her young niece as they park up to go shopping in Beverly Hills. Angela and her friend are later seen entertaining her niece as they make their way back to the parking lot. Daughter of Run DMC rapper Joseph Simmons, Angela, leaves a nail salon in Beverly Hills and is questioned about her financial worries by photographers as she goes to her car. She says that all business people have stresses about money. She is also asked if people were offered more money or more time off, which one they would choose. 'It depends how many lazy people there are', she replied. Angela is Joseph's second eldest daughter and makes regular appearances on the rapper's reality show 'Run's House'. She and her elder sister Vanessa design and run a shoe brand together called 'Pastry'. The curvy eldest daughter of Run-DMC rapper, Angela Simmons wanders around Los Angeles on an afternoon shopping trip with her friend. Fashion designer and socialite Angela Simmons was spotted on her way to a local nail salon, imaginatively called Nail Shop, to fix up her fingertips on a recent voyage around Beverley Hills. Daughter of music mogul Joseph Simmons, or Rev. Run as he is more widely known, Angela was accompanied on her way to the salon by photographers, with her actions within the store being monitored by the paparazzi from outside on video. 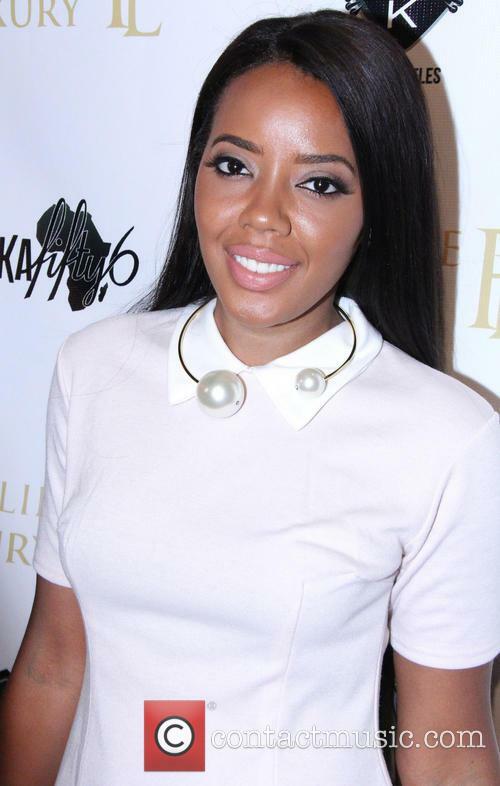 Reality TV star Angela Simmons leaves a nail salon in Los Angeles. As she leaves, she greets the photographers with a smile. They ask her if she finds guys who do a double take when they walk past her creepy or flattering, to which Angela replies that it's flattering. She is complimented on her chrome heels as she heads for an elevator.